Summary. Black-chinned Weaver Ploceus nigrimentus is a scarce resident of open grassland with scattered trees, occurring patchily from south-east Gabon to south-central Angola. 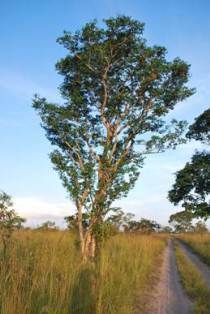 The Angolan population is known from seven specimens, including the two types, from the Bailundo Highlands of Kwanza Sul and Huambo provinces, with the last record in 1966. 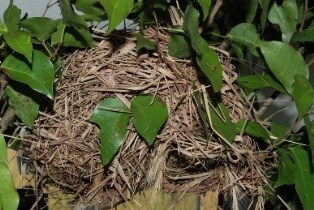 The species' nest is undescribed. In April / May 2011 MSLM observed a female and a pair of Black-chinned Weavers in the Capaia area of Lunda Norte province, north-east Angola, c.700 km north-east of the previous Angolan records and c.600 km south of the nearest known record in the Democratic Republic of Congo. He also collected an unusual weaver nest where one of these sightings was made, from a colony of ten nests on a tall tree in open grassland, identical to a nest found at LÃ©koni, Gabon, in 2006, where another Black-chinned Weaver was observed, and similar to the Black-chinned Weaver nest in the collection of the Royal Museum for Central Africa, Belgium. We compare the nest to that of other Ploceus weavers in Lunda Norte province, demonstrating that it is larger and has a different structure with the entrance towards the top of the nest. It is most similar to that of Baglafecht Weaver P. baglafecht. We provide the first description of the nest of Black-chinned Weaver and have deposited the nest in the Natural History Museum, Tring, UK. A brief history of records and specimens of the species is given in this paper. MSLM found a Black-chinned Weaver in Gabon in 2006, and another in north-eastern Angola in 2011. During the review process, attention was drawn to a nest of Black-chinned Weaver held in the Royal Museum for Central Africa, Belgium (RMCA), collected in Congo-Brazzaville in 1990. Details of the colonies found by MSLM may be seen: Gabon nest and Angola nests. Read more about Angolan birds at Birds Angola.